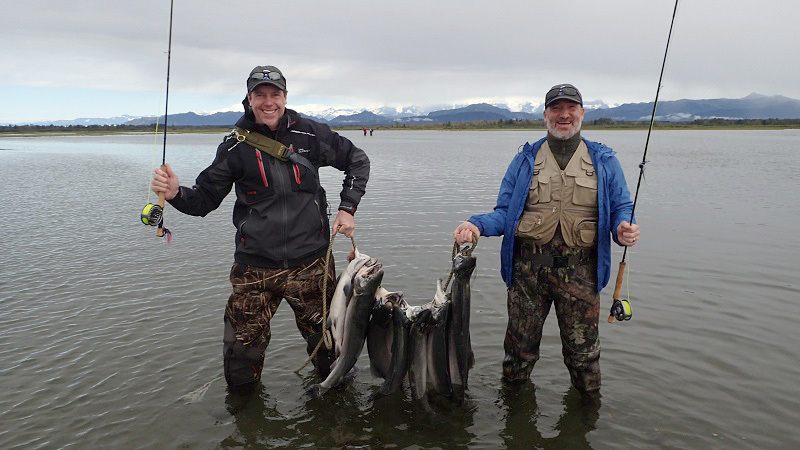 The very word "Alaska" brings images of calving glaciers, panoramic mountain ranges, abundant wildlife, and of course -- the very best fishing in the world! Fishing the remote wilderness with The Alaska Expedition Company is truly one of the premier outdoor experiences in the world today. Our combination of incredible fishing, proficient and friendly guides, gourmet food and private and comfortable accommodations, enables you to relax and enjoy this once-in-a-lifetime adventure. The time tested, well-built facilities and dependable equipment along with the knowledgable, experienced staff, relieves you of any safety concerns in this immense wild country. Located on the internationally acclaimed Tsiu (pronounced "sigh-you") River, you will be able to sight cast to literally thousands of chrome bright and aggressive Silver Salmon (Coho) fresh out of the surf from the Gulf of Alaska. Whether using fly-fishing or casting gear, you will love the thrill and excitement of the fierce attack and lively acrobatics of the celebrated Coho.